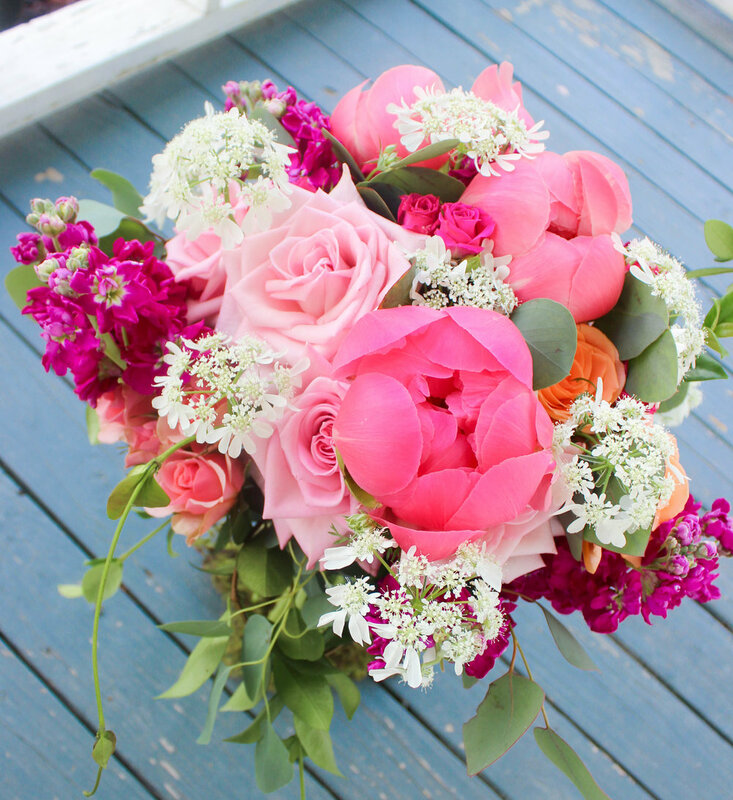 June weddings bring coral charm peonies if we are lucky! When Sarah said she wanted coral in her bouquets, we new these stunning coral peonies were perfect for her wedding. Sarah chose garden bohemian bouquets filled with shades of coral, pink and raspberry with lots of green foliage and a touch of white. We chose coral charm peonies, pink and peach roses and spray roses, raspberry stock and white orlaya with accents of eucalyptus and jasmine vine. The ladies in navy blue held bright bouquets of coral spray roses, raspberry stock and pink roses! Kissing balls full of matching spray roses were just right for these little girls! Lovely Lydia and Ilse roses look lovely together! Matching boutonnieres of lovely lydia and ilse spray roses and ginestra! The overall style/theme of the wedding was simple and classic. I just wanted something that was timeless and not trendy. I always knew I wanted I some shade of blue for the bridesmaids. I went with Navy because it’s more classic and flattering than any other shade of blue that I found. I knew since it was a summer wedding and I had navy dresses that I wanted colorful, summer flowers. I looked at a mix of pinterest ideas and The Floral Cottage social media. One of my favorite parts of my wedding day was the flowers. I could not have been happier with them. Thank you to Sarah for choosing The Floral Cottage to design for your wedding day! We enjoyed making these bright and fun bouquets for you. Much love and happiness to you and your husband! Bright summery shades of raspberry, coral and pink for Sarah's June wedding!